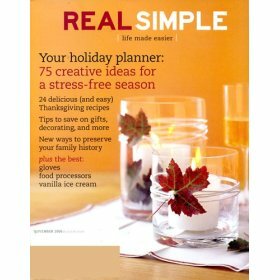 Creative advertising (love the GE firefly ad), practical advice for your home and luxurious perfumes all blend effortlessly throughout the pages of Real Simple. There I was wondering when I should replace a down comforter and this magazine had the answer. They also have some lovely quotes and ideas for decorating your home with Liz Claiborne home items, like the lovely bedding and towels. The do it yourself features are fun with ideas like a hostess gift you make up yourself with a basket and candles. Loved the articles like "organizing your recipes; 8 foolproof methods." But their advice on tossing cookbook in favor of just keeping a few recipes! Hello. There are some cookbooks you definitely want to keep. They always seem to put a spin on old favorites, like the modern cheesecake that is gourmet and elegant. The applesauce cake in the November issue uses chunky applesauce so people might think you spent all that time chopping apples. Saveur is a celebration of authentic cuisine with everything from Food Festivals to very easy-to-make recipes, like Blueberry Pudding. While there are a few book reviews for foodies to enjoy, the writing introduces cooks to international flavors and seasonal fare. Restaurants are also a feature as are gourmet cooking essentials. While reading you may discover a pastry shop or start to dream of making a recipe like Chicken Fried Steak. Yes, this very gourmet book has comfort food recipes as well as more complex recipes like the one for Olive Bread which actually only requires a minimum of bread making skills. After reading this magazine I'm normally in the mood to drizzle olive oil over just about anything I'm putting in the oven. The recipe for Stuffed Tomatoes and Summer Squash had me wishing it was October again and the recipe for Fig Jam reminded me of my childhood in Africa where we had a Fig Tree in the backyard. 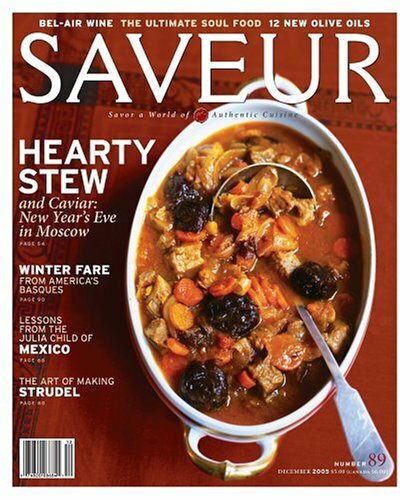 Saveur is filled with nostalgia, entertaining food adventures and delicious recipes. With Amazon's Gourmet food section, we can now find the ingredients to make many of the recipes in this magazine. Spa Parties and T-shirts that say "Delish" are very much a part of Rachael's magazine complete with pullout recipe cards and travel features. The recipe cards all have shopping lists on the back, so you can grab the cards and head to the grocery store. There is also a handy recipe index organized by categories at the end of the magazine. The Kids recipe section encourages young cooks to participate in family meals. This issue had a recipe for a delicious tuna salad with roasted red pepper and grape tomatoes. Just for Kids tips give ideas for how to juice a lemon and there are cute kid comments about the recipes. 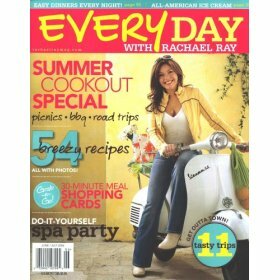 Everyday with Rachael Ray embraces life and does it with a realistic flair. In the June/July issue, ideas for picnics include shopping lists and recipes for Melon Skewers with Orange-Lime Marinade. Roy Yamaguchi cooks at home with his family and offers recipes like Miso Cod with Buttered Mushrooms. What I like most about this magazine is the realistic recipes complete with everyone cooking and enjoying life. The pictures are spontaneous and the series of pictures for the Ice Cream Cake are step-by-step heaven. Just when you think this magazine has everything you could wish for, an Everyday Menu Planner appears to give recipes and shopping lists. Grilled Shrimp with Cucumber Salad and Smoked Turkey Panini are must-have recipes for the summer. Peaches resting on a marshmallow meringue are perfect for dessert after the Baby Back Ribs with Jammy Glaze. This is a magazine about cooks, chefs and Rachael's recipes. The "Ask Rachael" section gives you a chance to send in e-mails to ask Rachael about her life or to have your foodie question answered in the magazine. She also has decorating advice so now you know what to do with the shells you collected at the beach (or you could find them at Pier 1). What is the best feature in this magazine besides the recipes? "What is in the refrigerator of your favorite Celeb?" I'm always intrigued. If you collect cookbooks, there are many featured in this inspired magazine. The advertising doesn't seem to overtake the pages and is subtly blended in so it feels very natural and interesting.